People often say cat urine is the worst. When a seller told me he was thinking about replacing the carpeting in a home I was about to list as a short sale, I was initially against it. That's because short sales are sold as is. Until the seller told me the house smelled like dog pee and cat urine. I could see why. There were spots everywhere on the carpeting throughout the house. It looked like the previous tenants had locked a pack of dogs or cats in the house for months, with no way for them to get outside. It smelled awful. The urine smell was so bad I had to hold a scarf over my nose. Which didn't help much with the odor. My eyes watered. The longer dog pee or cat urine sits in a carpet, the worse the problem becomes. Bacteria builds up, and the urine is soaked not only into the carpeting but also into the pad below and, in some instances, the wood floors and its sub-floor. Pet urine can also seep into concrete. Bleach. The seller were thinking of using bleach to clean the concrete floors after removing the urine-stained carpeting. Bleach will not kill the odor of dog pee or cat urine. It simply disinfects. Bleach is harmful to breathe, and it's toxic for your pets, too. Ammonia. Ditto on the list of things not to use to clean up dog pee or cat urine is ammonia. That's because dog and cat urine has an ammonia odor. Ammonia will make it smell worse. And whatever you do, don't ever combine bleach with ammonia or you could die from inhaling the fumes. Mixing bleach and ammonia is extremely dangerous. Homemade Remedies. Common household items such as vinegar, peroxide, dish detergent or baking soda all work to some degree, but they never really get rid of that persistent stinky urine odor. 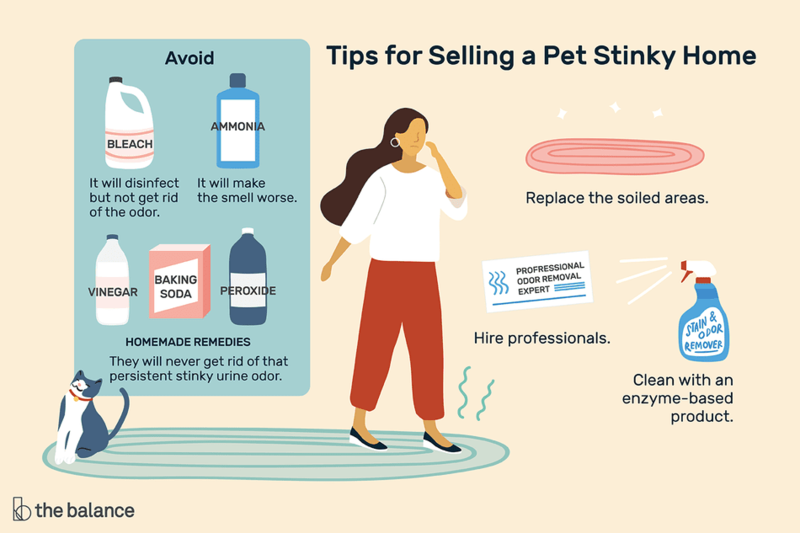 You might think you have to burn it down or sell the home to get rid of a lingering dog or cat urine odor, but that is not the case. There is a permanent and effective solution. It's just not for everybody. True story. My cat, Brandon, lived another 5 years after he was diagnosed with kidney disease. I made him a pen to sleep in at night. It was 4 feet x 4 feet, wrapped on all four sides and the floor in a plastic tarp, the type that people throw over leaky roofs. He had a low-rise litter box and a cat condo. I replaced the tarp from time to time and regularly cleaned it, which kept my home odor free from urine smells. But before he was diagnosed with kidney disease, Brandon had already destroyed two bathrooms. He waited until we went on vacation and then, in an obvious state of distress, began to use an area in the bathroom as his litter box. This went on for 2 weeks. He did the same thing a short while later in our second bathroom. Both of the baths had carpeting. Ick. No home should have carpeting in the bath. Ever. My husband claims I was looking for a home improvement project, but I really did not want to deal with a cat urine problem. I gutted the first bathroom and completely remodeled it. In the second bath, I pulled up the floor and replaced the sub-floor, then tiled over it. Replacing the soiled areas, down to the sub-floor, is a very effective way of dealing with dog pee or cat urine odors. Because it removes every piece of material tainted with the offending scent. But not everybody has the patience, time, or money to tackle a new home improvement project. The second best way to clean up dog urine and cat urine odors is to use an enzyme-based product that breaks down the bacteria and neutralizes the odor. You can buy this urine odor removal product online or at pet stores. You may need to treat the area with a product more than once. Do not use detergent or any home-based remedy first. Saturate the area with the urine odor removal product. Blot it and let it air dry. Treat again. If ​the carpet is heavily soiled, you may wish to replace the carpeting or that area of the carpet. If you do pull up the carpet, make sure to treat the urine stains left behind before laying new carpet. In reading through some of the advertisements for portable ozone odor removal machines, my first inclination is it sounds like wearing a tin hat to attract aliens or selling snake oil. I have not heard of any concrete evidence that they work very well. I have had clients tell me that hiring professional odor removal experts who use expensive ozone odor removal machines, that they work. However, the EPA has its doubts, and there are also health hazards involved. When I bought a home with a dirt-floor basement many years ago that cats had long used, way before I bought the house, I hired a professional company to spray the basement with enzymes. It worked for about a month and the odor returned. Since they guaranteed their work, I had them spray a second time and it got rid of the cat urine smell.